With a population of over 24 million, it’s no wonder that apartments are small in the Chinese mega-city of Shanghai. 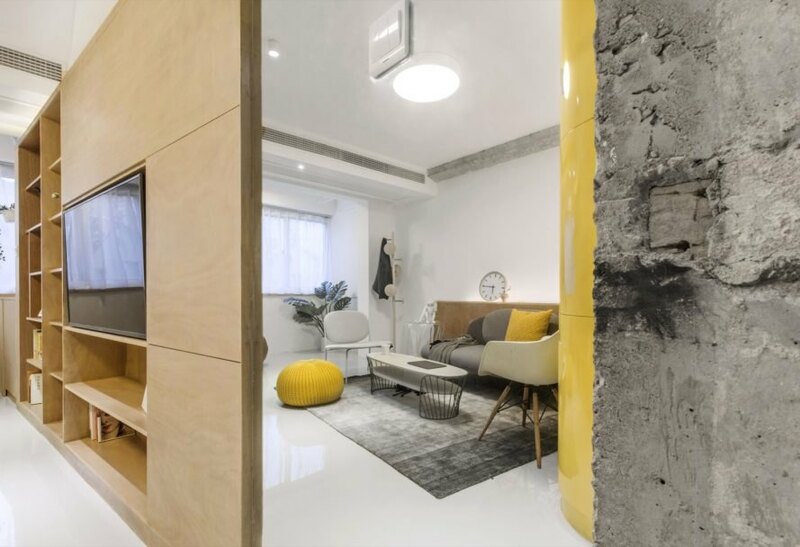 Thanks to clever space-saving techniques and design, however, making life pleasant in small spaces is more than possible, as seen in this recent apartment renovation on Kangping Road. 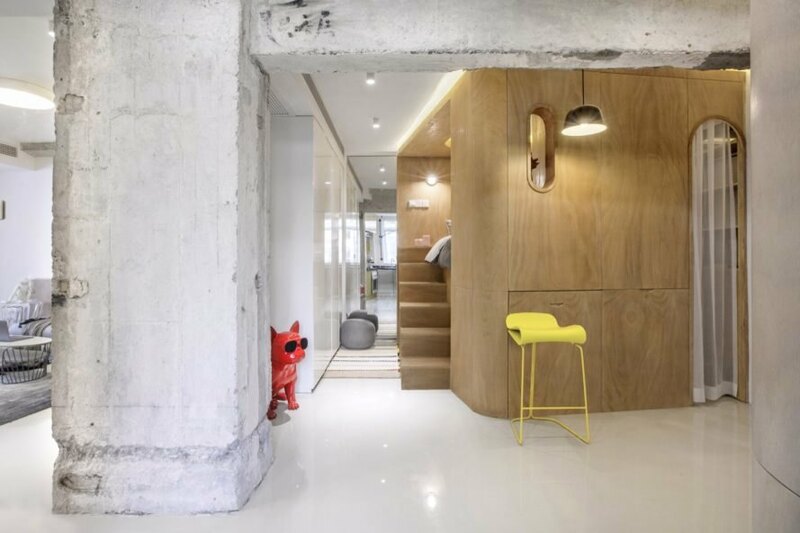 Local architecture practice TOWOdesign transformed a tiny apartment into the 10 Degrees House, a multifunctional abode that uses enclosed volumes to cleverly delineate its various programs while maintaining an open and colorful character. 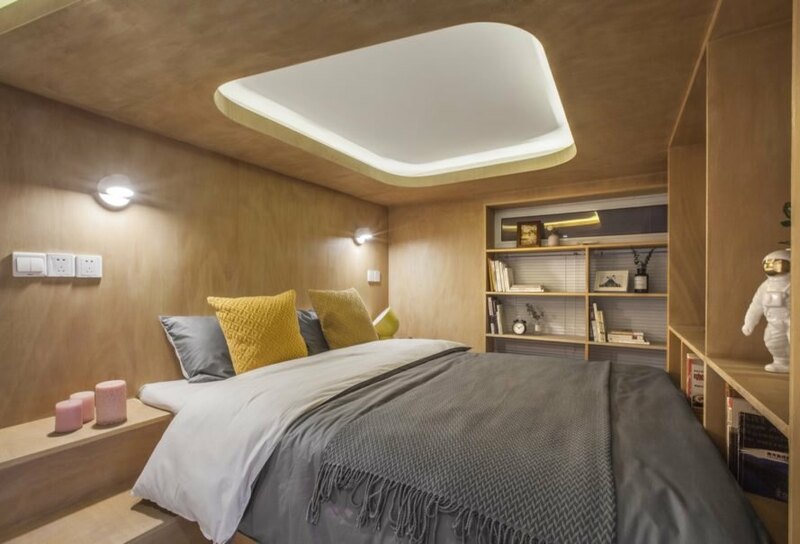 Despite the 430-square-foot apartment’s small footprint, the brief asked for a home that would include a bedroom as well as an office, entertainment area, storage and all other functions necessary in daily living. Rather than walls, the TOWOdesign inserted four “function boxes” with curved edges, each of which services a different program. The four boxes include the bedroom, bath, entertainment space and the centrally placed kitchen with integrated storage. 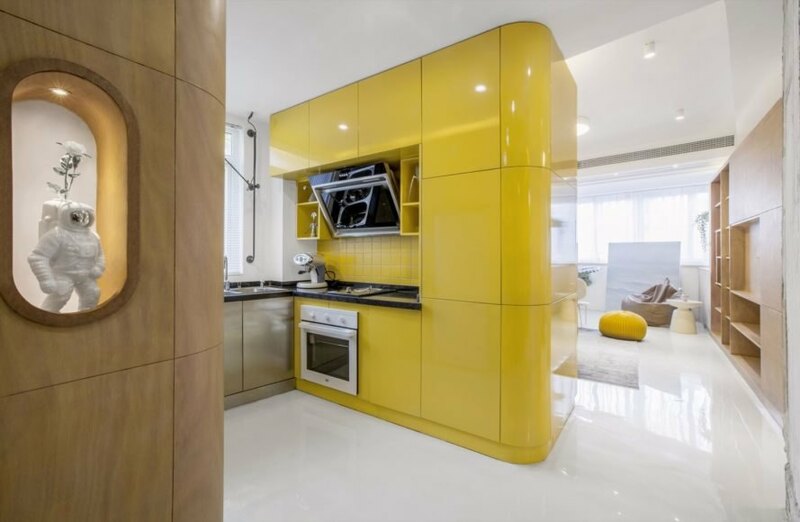 All of the boxes are wrapped in light-colored timber, except for the kitchen unit that is covered in glossy, bright yellow panels. 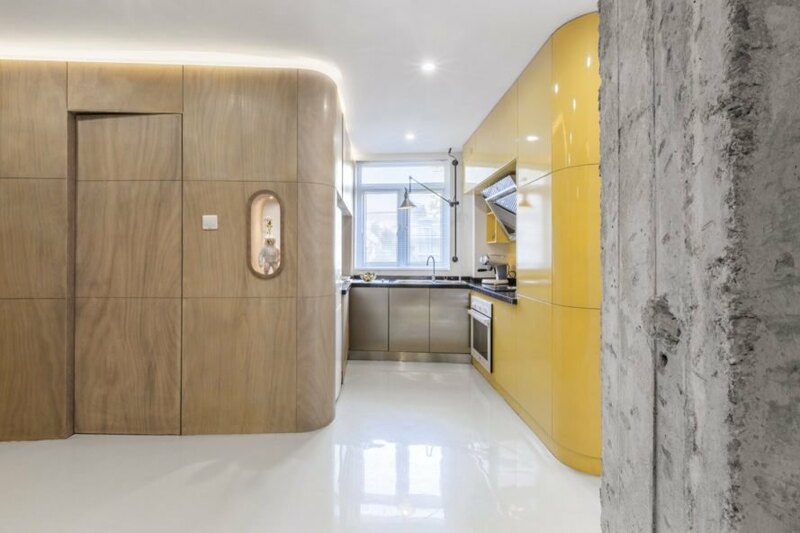 The spaces in between the rotated volumes, such as the living room and open kitchen, feel spacious thanks to the use of white walls and large mirrors. Space-saving elements, like the folding dining table and plenty of hidden storage, help reduce visual clutter. The entertainment console is housed in one of the rotated units. By rotating the volumes by 10 degrees, the home retains an open feel thanks to extended sight lines. A look inside the bedroom volume. 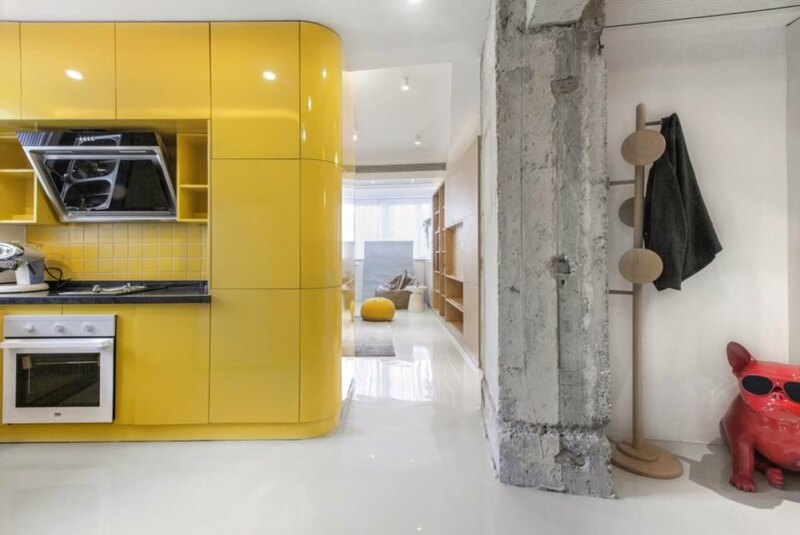 The bright yellow kitchen unit occupies the heart of the dwelling. The bathroom is tucked inside a wood-paneled volume. The open kitchen also features a foldaway dining table. The living room seen reflected in the mirror panel next to the television unit. The mirrors and white walls help open up the space. A triangular shaped light box was installed behind the couch.